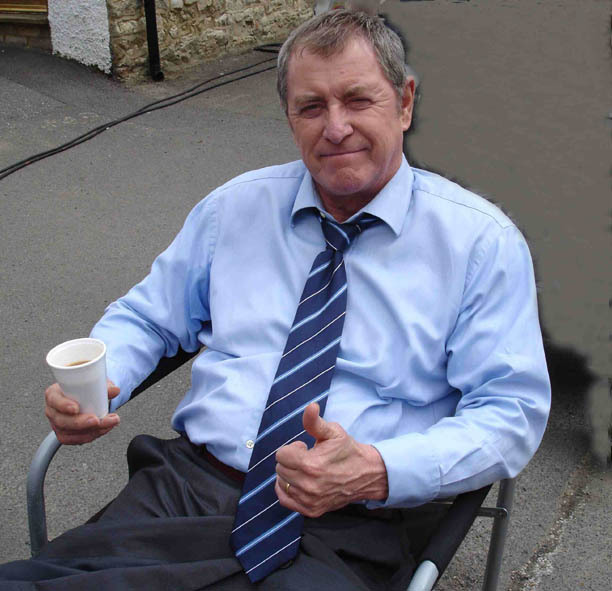 Sadly John Nettles filmed his very last episode of Midsomer Murders earlier this year. John has a rich supply of memories to look back on from his time making more than 80 Midsomer Murders films. "I said yes to the part back in 1996 and I have never regretted it. There have been over 120 murders, Barnaby has never failed to solve a case, the sun always shines and many of the best British actors have appeared in the show, some more than once. It's been a complete joy. "My favourite memories will be of the cast and crew alike. I will miss the camaraderie and company of all the different actors who have graced our episodes of the show over the years. Each time we filmed an episode it was like a reunion of long lost friends." John is spoilt for choice in naming his favourite guest stars. "More than any other drama of its kind, Midsomer casts artists who are classically trained. Many join us from the Royal Shakespeare Company and the English National Theatre. As a result I have been fortunate enough to work with countless valued friends. I have enjoyed working with them all, without exception. However, a few do stand out in my memory. Richard Briers, a truly delightful and talented man, playing a murderous vicar, Donald Sinden as an irascible ex-army officer, George Cole, exquisitely sensitive as an old man with hideous memories, and Alan Howard, the greatest Shakespearean actor of his generation, playing a wickedly funny, sexually dysfunctional, village squire &ldots;. the list goes on and on. I have also been spoilt with some of the best actresses - Celia Imrie, Liza Goddard, Jenny Agutter, Lucy Cohu, Samantha Bond, Isla Blair, Honor Blackman, Isla Blair, Cherie Lunghi, Clare Higgins, Alice Krige - to name but a few! You can't get better than that." "I do love the episode called 'Hidden Depths' where Oliver Ford Davies is drugged and staked with arms and legs pinioned by croquet hooks on his own lawn which had been marked as a target. He is then bombarded with bottles of wine from a giant catapult with his wife watching. "I also loved quite an early one, 'Destroying Angel', when Jonathan Coy is killed by his own drinks cabinet, which had been unscrewed from the wall. He is saying to his wife, played by Abigail McKern, 'when will you get it into your head that no one is trying to murder me', when the drinks cabinet drops on him and promptly kills him." Adds John: "In 'Blood Wedding' an actress was stabbed through the ear with a hat pin. The scrunching noise that it made when it went in was blood curdling but great, another favourite of mine. "The church where we filmed that episode in the village of Denham, Bucks, is one of my favourite locations and it was also a lovely one because my screen daughter Cully, played by Laura Howard, gets married and I got to walk her proudly down the aisle." Some of the picturesque locations used to give Midsomer Murders its traditionally English look have been used on several occasions, filmed from different angles or using different rooms. Says John: "My number one favourite location has to be Dorney Court near Windsor. It has been used in the episodes 'Strangler's Wood', 'Bantling Boy', and more recently in 'Secrets and Spies', when it was the mansion home of Benjamin Whitrow. "We at Midsomer have been back there so many times that I think we have squatters rights now. I love the architecture and the historical interest, and returning to it. Dorney Court has always been the manor house of Dorney village, which was first recorded in the Domesday Book." John adds: "I love the locations in Midsomer and often go back to have lunch in villages like Bledlow or The Lee in Buckinghamshire. We work in some beautiful old manor houses and gardens, and the churches are haunting and romantic with stunning Norman architecture. It's not always as peaceful as it appears, though - filming often gets interrupted by aircraft noise and garden strimmers!" John was recently honoured with an OBE for his services to drama. He says: "I am absolutely thrilled and delighted to receive this." John finished filming his final, 13th series this summer, although his episodes will continue to be seen on ITV1 well into 2011. But while viewers will continue to enjoy his crime-busting skills, John himself will be planning a future away from the killing fields of Midsomer. Projects under discussion include a starring role in a new series being developed for ITV1 by Bentley Productions, provisionally entitled Country Matters. He wrote and narrated the recent series The Channel Islands At War, which marked the 70th anniversary of the invasion and occupation of the islands by the Nazis, and hopes to do more documentaries. His first job after leaving Midsomer is back on stage in Sheffield, playing Claudius in a new production of Hamlet alongside John Simm, Michelle Dockery and Barbara Flynn. Says John: "There is a lot I still want to do and I just feel that it is now the right time to go and explore pastures new. I hope Barnaby has managed to save sufficient residents of Midsomer to ensure that there are a good amount of people left for his successor to protect - and arrest accordingly." Responsibility for policing the dangerous streets of Midsomer now passes to Neil Dudgeon who has starred in The Mrs Bradley Mysteries, Common as Muck, Messiah and The Life of Riley and joins the cast to play DCI John Barnaby, a cousin of the original Barnaby, who also works in the force. Neil has previously appeared as a guest star in "The Sword of Guillaume", when Barnaby is despatched to the South Coast and enlists his cousin's help in solving a crime. Neil takes on the starring role in the 14th series of Midsomer Murders, which began shooting this summer. John Nettles says: "I wanted to die in noble fashion in the service of my country and then be buried with full military honours in Westminster Abbey. In the event, Tom and his long-suffering wife Joyce will simply retire. It's always better to leave when people want more. "It has been a joy to be involved in such a long running series, with so many good actors and great storylines. If Neil has half the good times that I have had on Midsomer then he will be in seventh heaven. I am only worried that he is much younger than I am and a much better actor!" Says Neil Dudgeon: "It's great to be joining such a brilliant and successful series. It's the kind of television that isn't on a lot anymore, yet there is still a great appetite for it. I will do my very best to follow in John's footsteps. He's a hard act to follow but I'm really looking forward to playing the new Barnaby." Producer Brian True-May adds: "Although we will miss the huge contribution that John has made to the series, the brand of Midsomer is so strong that I am confident of its continuing success. We look forward to our new Barnaby tackling more murder and mayhem in Midsomer. "Having worked with Neil Dudgeon twice on Midsomer Murders already, I feel he is the perfect choice. I admire him as an actor and know he will be a wonderful addition to the team and a great ambassador for the series."